Heat oven to 400°F. In large bowl, mix chicken, pasta sauce and vegetables. Pour into ungreased 9-inch square pan. In small bowl, mix Bisquick mix, Parmesan cheese and butter with fork or pastry blender until crumbly. Stir in egg. Sprinkle over chicken mixture. Bake 20 to 22 minutes or until topping is light golden brown. A 16-ounce jar of purchased Alfredo pasta sauce can be used for the cheese sauce. 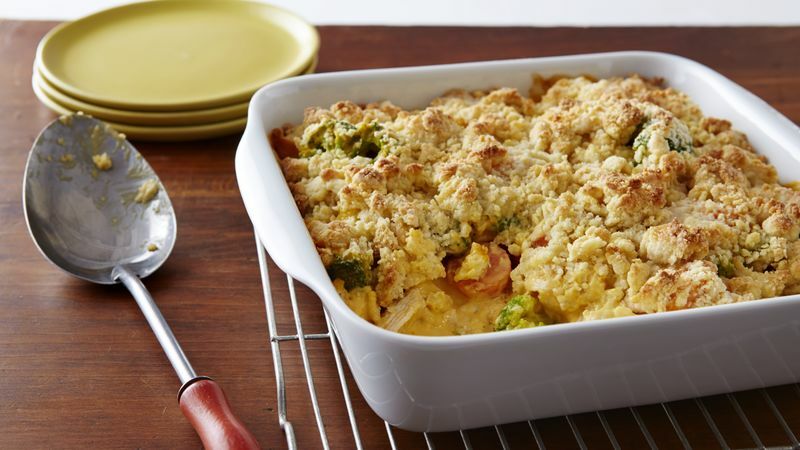 Using frozen (thawed) cooked chicken or two 5-ounce cans of chunk chicken, drained, will give you a head start on this casserole.